Recycling bags. They’re a problem. We’re not talking about grocery bags that we ask residents to stuff into one, and put on top of their blue boxes. We’re talking about using curbside recycling bags in lieu of blue boxes. The Quinte recycling service was designed and developed in 1990 for blue boxes to be used as curbside containers. And for a reason. By using blue boxes, drivers can see the material before collecting it, and can reject it if unacceptable material is present, or if recycling has not been sorted correctly. 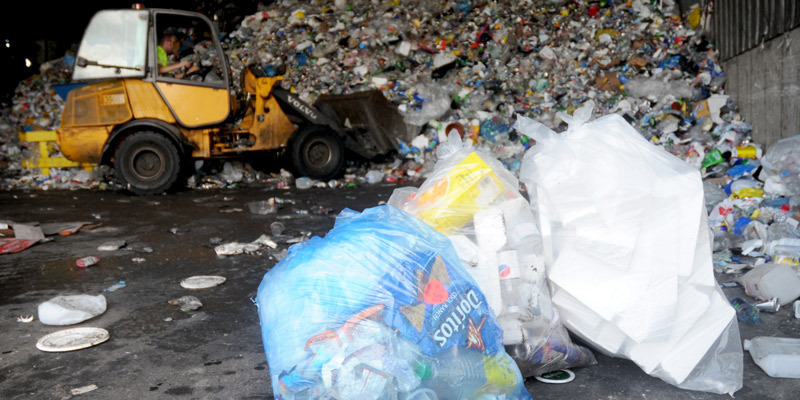 The material is loose, making further sorting at the recycling plant easy and cost effective. The recycling plant is divided into two sort lines. One line is for paper, and one is for plastic and metal. Sorting matters. Recycling bags on the other hand, are a problem in Quinte. It is hard to determine what is in them, they usually contain unacceptable material, they are usually unsorted, and when they arrive at the recycling plant in Trenton, we have to rip bags open before they get to the sorting line. It is costly to the resident, and the program. A blue box, you buy once. Recycling bags are an ongoing purchase. 1) Recycling bags must be clear. Our drivers will not collect any other type of recycling bag. 2) Each material must have its own recycling bag. Tin cans must have their own bag. Aluminum cans must have their own bag. #1 Plastic containers must have their own bag, #2 plastic containers must have their own bag. Boxboard must have its own bag. Cartons must have its own bag, and so on. 3) Glass is not acceptable in a bag. Put glass to the side of your bags. That’s it. Those are the requirements. Mixed recycling bags, or tinted recycling bags will not be collected. Compare this with two blue boxes. In one box you put all your paper products together in one, and in the second you put all of your plastic and metal containers. Glass bottles go on top of your paper box. We always recommend blue boxes. As you will save time and money. We sell them at the recycling plant for $8.00ea. When they break, you can exchange it for a new one for no charge. Your old blue box is then recycled. It’s also important to remember that milk crates, rubbermaid totes, or any other type of container that is not a standard curbside blue box, is not acceptable.